After stepping out of Impa’s house, I faced one of Breath of the Wild’s endless choices: which Divine Beast (if any) I was going to set off to free first. The game subtly nudges you toward the realm of the Zora in that early stage of the story, and I was already in the area, so I struck out in a northerly direction to the Lanayru Wetlands. The journey just to get to Vah Ruta is an adventure in and of itself. The gauntlet of enemies you must bulldoze through as you make your way up Zora River is a grueling, but thoroughly satisfying action sequence. Some of those shootouts with the Lizalfos archers felt like they could have come out of a third-person shooter. I also endured a hilariously embarrassing death to a bunch of Electric Keese — rain and electric bats be darned. 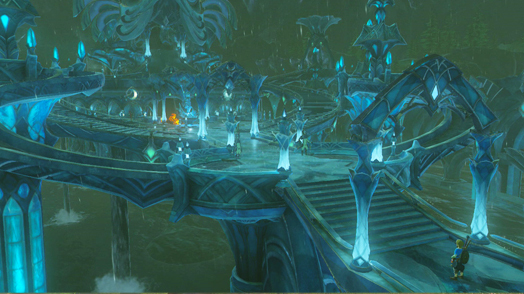 The trek eventually brings you to the sprawling, gorgeous Zora’s Domain, which might just be the most impressive settlement in the history of the Legend of Zelda series. After getting the backstory on the plight of the Zoras, I made my way up to Ploymus Mountain, where I initially got throttled by the Lynel before I employed a more stealthy approach to grab those Shock Arrows. I got to flex my combative prowess more appropriately in the thrilling encounter with Vah Ruta (that music is still stuck in my head), and once I subdued my first Divine Beast, I entered the titan with the goal of solving its interior. I always expected Breath of the Wild to change a lot of conventions for The Legend of Zelda, but nothing prepared me for the total fish-out-of-water feeling I experienced in my first Divine Beast fight. It wasn’t long after entering Vah Ruta that I was at a total loss. Sure, I found that first terminal which just required a lever to be turned a few times to pull it out of a pool, and I acquired the map shortly after, but what followed was a whole lot of aimless wandering. I must have spent anywhere from 20-30 minutes meandering through Vah Ruta’s interior without any meaningful progress. Day turned into night and then into dawn over the East Reservoir Lake as I ambled about, baffled as to what I was supposed to do to find the remaining terminals. The problem was that I was still thinking like Breath of the Wild was any other Legend of Zelda game I had played in years past. I was looking for all of the things which I was accustomed to finding in a dungeon: chests containing keys, locked doors, obvious switches I was meant to shoot or strike, even just enemies! Only once I took a good, long look at the massive water wheel and busted out the Sheikah Slate that I realized I did, in fact, already have some tools at my disposal to solve these puzzles. I halted the water wheel with Cryonis and activated that terminal, but the true nature of the Divine Beast still wasn’t apparent to me. It wasn’t until I began to experiment with that larger wheel, the one in the heart of Vah Ruta, that the awe-inspiring “aha!” moment occurred. While taking a few minutes to do a serious study of the dungeon map for the first time in years with a Legend of Zelda game, I looked into just what all those different purple arrows meant. Mechanisms clanged, the chamber trembled, Vah Ruta bellowed, and its trunk shifted to a new angle. The realization washed over me like the waterfall that spurred the wheel’s motion. With the Sheikah Slate, I could control the dungeon I was exploring! This was not a case where puzzles would be overcome through a simple input and limited to small, confined spaces like a single room. No, Vah Ruta’s puzzles demanded that I manipulate the very foundation of the massive structure I stood within. It was one great toy box for me to command — a game design feat of pure genius on the part of the good people at Nintendo. Awe heightened to euphoria during the sequence where you can traverse Vah Ruta’s trunk. Never in my life did I think puzzle solving could be accomplished on such an enormous scale. To reach that terminal required a combination of wit and platforming skill. You had to be judicious with your footfalls as you guided the trunk that’s as long as a skyscraper is tall; only moving in concert with the trunk granted you a safe purchase before the terminal. 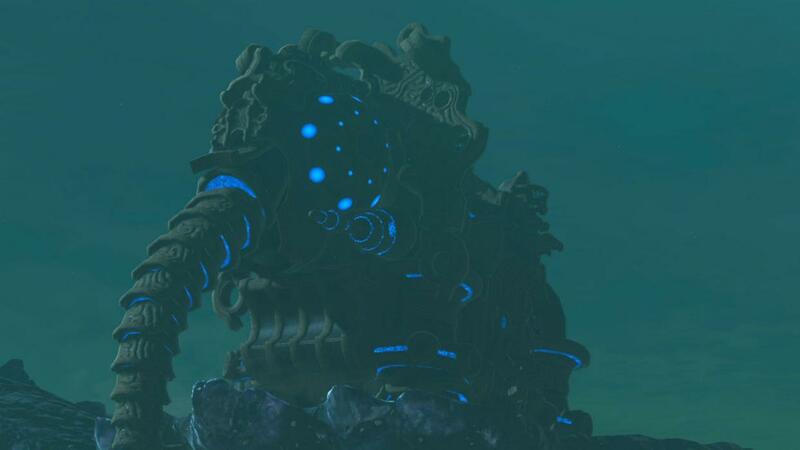 Vah Ruta concluded in a way that was fitting for an experience which shattered my preconceived notions of a Legend of Zelda dungeon: with a boss fight that beat the brakes off of me. Never in my then-24 years of playing the series had a game’s first boss killed me, but Waterblight Ganon stepped up to the plate and knocked that ball out of the park. A second attempt was successful for me, but not without exhausting just about all of my arrows and health recovery items, as well as an emphatic lesson that, to overcome Breath of the Wild’s challenges, I needed to be prepared more than I ever was in previous Legend of Zelda adventures.